Mid-South Sculpture Alliance is a non-profit arts organization that advances the creation and awareness of sculpture and sculptors. MSA creates opportunities for its members through exhibition, education, and networking opportunities centered on traditional and contemporary approaches to sculpture. The Diane Komminsk Scholarship for Outstanding Student Achievement is now taking applications. Students must be seeking an undergraduate or graduate degree at an accredited institution and have the sponsorship of a MSA member to apply. Ten scholarships of $1,000 + a one year MSA membership, exhibition and speaking opportunity will be awarded. Deadline for application is April 15th, 2019. 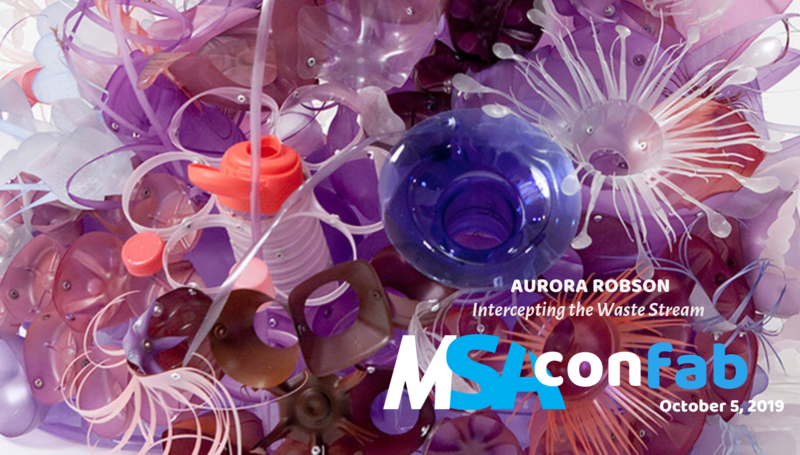 Join MSA in an intimate discussion and dinner with renown artist Aurora Robson on October 5th, 2019. A multi-media artist predominantly known of her meditative work intercepting the plastic waste stream, Robson creates installations, sculptures and reliefs. MSA is partnering with the University of Cincinnati's College of Design, Architecture, Art and Design to bring you our next conference. The conference committee is working hard to create a fantastic four day schedule of learning, networking, and lets face it, fun. Interested in helping? Have some ideas about panels, workshops, or speakers? One of MSA's goals is to assist students in joining the profession of artist and sculptors. MSA works with students in a number of ways, offering scholarships, exhibition opportunities, workshops, metal pours, mentoring, conferences and confabs. But the biggest benefit to membership? MSA professional members; their knowledge, their expertise. Professional sculptors make up our biggest category of members. Ranging from all over the nation, our members have a wealth of knowledge, talent, and expertise. MSA seeks to help sustain these professional artists through opportunity to exhibit, learn, teach, and mentor. Panels, confabs, conferences, workshops, exhibitions, artist talks and more. Wether an academic institution, museum, gallery, sculpture park, or public art entity MSA can help. We work with institutions to craft Calls to Artists, develop contracts, install and de-install large scale sculpture, and handle pr. We offer vendor, associate, and university memberships which include bulk memberships for professors and students and additional sponsorships for the scholarship competition. MSA serves sculptors, educators, artists, curators, and art enthusiasts to build and sustain their work in the field of sculpture.